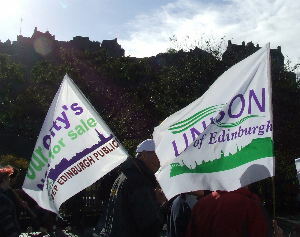 The campaign against privatisation is stepping up as the Council faces critical decisions in the coming weeks. A report this month will say that the outline bids for Environment & Integrated Facilities Management will be evaluated and compared to the internal comparators over July. Another report will then go to Council in August to decide whether it stays in-house or whether there is a preferred bidder. The report will also recommend that the Corporate & Transactional strand moves into full competitive dialogue – with one of the bidders likely to drop out and two others remaining in the frame. The final decision will not be made until the end of this year. The ‘Our City’s Not For Sale’ campaign continues and has included briefings, an information pack for councillors, expert analysis of the process, leaflets and street leafletting by members in the city centre. “Technical support from full time officer Peter Hunter, from HQ experts and lessons from colleagues in Newcastle have all been essential in this campaign”, said John Stevenson, Branch President. He warned the Council on STV at the most recent UNISON demo that “like the trams, these contract will come back and bite them one day”. John was confident that the work UNISON has been doing will expose many of the problems and put real pressure on the Council to reconsider. “But we can only do that with our members’ support and we need you to get involved and throw your weight behind the campaign”, he said.